Worldwide release: March 1, 2018. 72 pp. In one of the first classes of literature I attended several years before, I recollect the professor compare the act of reading a poem to peeling the layers of an onion. 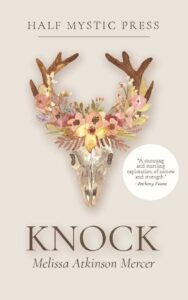 In engaging with Knock, published by Half Mystic Press, this analogy holds true. The book is unflinching in its exploration of diverse pre-occupations, best discovered through a series of close reading than a hurried summarization. The poems burgeon in between the paradigms of spaces, to bewilder and redefine. There is a recurrent visibility these poems render to the consciousness which is whole in its longing. The expanse of Atkinson’s canvas maintains steady growth, with potent analogies in its multitude of nuance. The collection offers the reader a sense of collective memory while delving into myriad interiorities of the mind. The imagistic prowess of Atkinson’s work cannot be overlooked. Once again, the imagery in her poems intermingle with diverse pre-occupations. Take for instance a line from the poem “mother, ice storm”: “we plucked out the cotton sky.” (p.5) Here, the usage of the word “we” paves way for, all at once, a sense of agency and collective consciousness in its combination with the pastoral. In conjunction with the employment of imagery, Atkinson borrows from a fluid space of the spirit to feed the divine feminine. Only, the results that arise unmoor to their own accord, an uncharted flight. This creates room for the spirit to conjoin with forces of nature. The most powerful example of the way in which this convergence takes place manifests in the poem “standing at dawn with my mother”. A wreath of eco-poetry emerges from this collection, blurring lines to connect all forces, out of which some stupendous images arise: “foxes carried the moon in their fur”, “Our souls paused like kites in the salt-grass” and “your breath at my shoulder making sapphires in the early fog” (p.17) to refer to a few. The Anthropocene element in this collection is multilayered in its semblance. The irony in this collection is subtle, unhinged and mushrooms in unlikely corners. In the poem “too swift”, Atkinson writes, “All I have is what I stole” (p.9) In a similar vein, in the poem “to gain entry”, she reckons, “speaking doesn’t make you // freer than silence.” (p.26) A spatial fluidity emerges in these poems in the form of a strong, matriarchal spirit. In the poem “your women should be grave,” the images of a mother cow looking at its dead calf, the moon; and the idea that everything that takes root in the dark is and must be blessed has an otherworldly appeal. The reference to witches is a focal point of both; resonance with and reverence to women who do not live as society might expect from them. Instead, they recognize, erect and celebrate their unique voice in their minds. 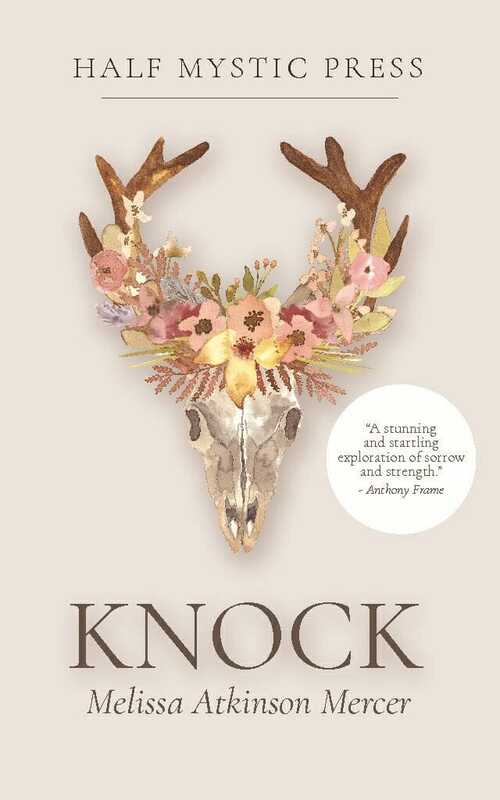 In the titular poem “knock”, Atkinson demands a sense of urgency to the pluralities that take root and burgeon: “If I could be loud enough, if incessant, the door might truly open…” Atkinson reminds us that while the action commences from being a seeker, there are different methods which may encompass seeking, and thereby shackles norms of the mythical and material self. This seventy-two page offering is a mouthpiece for the elegiac and illuminating.